Fiberbuilt Golf Mat Systems are excellent for home use and are the number one choice of the best golf courses and driving ranges world wide. Found at thousands of commercial driving ranges, and used by teaching professionals and players serious about improving their game, the Fiberbuilt Grass Golf Mat is your own personal grass-like hitting surface to use at home. Made with a special patented technology, it has the true feel and play of grass, allowing you to practice your swing with no hand shock or arm injury. A special grid line helps you improve your alignment and check your ball position. Feel how your clubs will perform on the fairway with realistic ball trajectory, spin and yardage. Fiberbuilt''s friction tee holder allows you to practice with your own wooden tees, adjusting them to your height preference. Take what you learn on the mat directly to the course and watch your game improve. The mat will never rip or tear. It's easy and fun to practice as often as you like. If you have any questions regarding the Fiberbuilt 4'x5' Golf Hitting Mat, please give us a call, we would be happy to help you with any questions you may have. 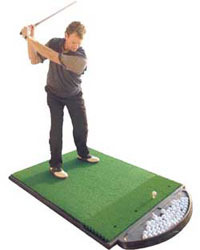 Write an online review on the Fiberbuilt 4'x5' Golf Hitting Mat, and share your thoughts with others.